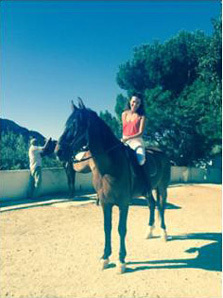 No matter what your riding experience or ability, you are very welcome at Los Olivillos – we have 14 sure footed well behaved Spanish horses. 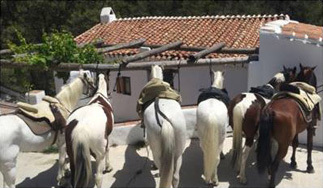 Horse riding varies from gentle treks to the surrounding white villages of Competa, Frigiliana and Torrox through the breathtaking scenery of the National Park to the more extreme trekking across mountains to the Granada Province. All rides are led by an experienced guide. 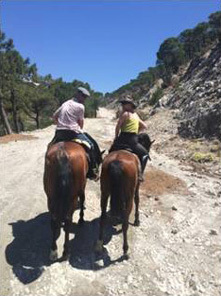 Whether you spend a few days or weeks at Los Olivillos – your riding holiday will be tailored to your individual requirements and you will have our undivided attention. 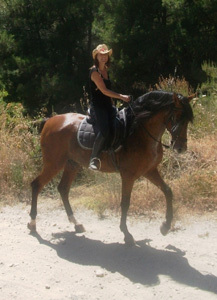 You can ride as little or as much as you wish on an Andalusian horse to suit. Our horses are all forward going , safe and very well cared for. Most rides include a visit to a local taverna to enjoy a drink , e.g. beer, coffee, soft drinks or local wine. All full day rides have picnic lunch provided. Once you return from your ride, you will be able to enjoy a nice chilled drink, perhaps a gin and tonic with a slice of lemon from one of our trees and then you can relax by the pool or lounge in the hammock reading. We can also arrange by request to take you to local villages, the beach or other local attractions. 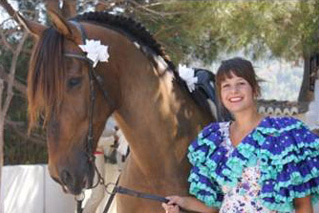 We also offer guests the chance to accompany us riding in one of the local village ferias (certain dates in the year) where you can enjoy typical spanish culture at its very best!